This Bistro set is great value for money and designed for frequent outdoor use. There are two chairs included and can be stacked up to 8 chairs high. There is a small amount of assembly required after delivery. Best suited for busy cafes with street front seating. Plaza bistro sets consists of two aluminium chairs with integral arms and an aluminium outdoor café table. The table requires some assembly. This lightweight bistro table is priced at a very competitive price and delivery is next day and free. 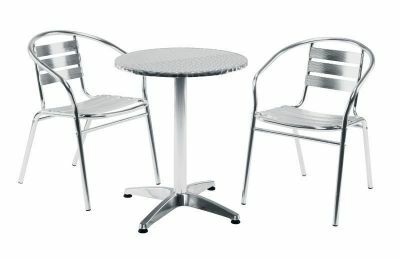 Plaza bistro sets are suitable for use in commercial cafes and restaurants and carry a five year guarantee and design and manufacturing defects. Plaza outdoor café chairs are stackable up to 12 high.